Bernardini S/A Industria e Comercio (Bernardini Industrial and Commerce Company) of Sao Paulo, Brazil, which operated from 1912 to 1992, was originally a safe manufacturer. During its later years it branched out into vehicle production, with products including the M41B and M41C Light Tanks upgrades from the American M41, and the X1, X1A1 and X1A2 Light Tank rebuilds of the American M3, the MB-3 Tamoyo tank and the Xingu BT25 and BT50 wheeled vehicles. The first 50 M41 arrived in Brazil in August, 1960, and were distributed to the Mechanized Recognition Regiments. The 1st one was in Santo Angelo, the 2nd in Porto Alegre, both in Rio Grande do Sul. Others were sent to the Mechanized Regiment of Recognition in Rio de Janeiro, (then Estado da Guanabara), replacing the old M-3 Stuart then being used. In the following years, up to the beginning of 1970, approximately 340 M41 arrived in Brazil in the M41 A1 and A3 versions. The fact of owning large amount of light tanks led the army together with the private sector to perform a modernization program. In 1978 a M41 was sent to the Bernardini S/A Indústria e Comércio, traditionally manufacturer of safes since 1912, and in a working together between that company and the Board of Ordnance, through Research and development of the Institute Army produced the modernized version in Brazil called the and M41B, it also participating engineers of PqRMM/2 (Motomecanização of the 2nd Regional Park Military region of São Paulo) and culminating in the final version M41C. This modernization was the result of the need to act use the main armored in use in the army, until then, considering that the purchase of new equipment was impossible at that time, due to financial difficulties and policies. Initially the modernization was made by the change the engine, the gasoline original was replaced by a DS14 Scania diesel model, keeping the original transmission, replacing the Groton electric generator, a new dashboard was added, in addition to adopting a 90mm high velocity cannon, capable of firing armor piercing ammunition, and improvements of the armor in the front of the turret and protection of tracks through side skirts and adoption of smoke grenade launchers. 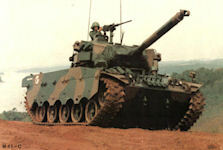 Several Brazilian army units still operate the M41 in their modernized version done by Bernardini Company, all in the Armoured Chivalry Regiment – RCB: the 20th in Campo Grande, MS, the 9th in São Gabriel, the 6th in Alegrete, the 4th in São Luiz Gonzaga, all in the state of Rio Grande do Sul, as well as in the Andrade Neves Chivalry School Regiment, in Rio de Janeiro, state of Rio de Janeiro. A total of 300 vehicles were modernised, though these were not completed in 100% of the original idea, but aroused attention in several users of M41 in various parts of the world and the idea was to sell the kit to modernization. In the years 1987 and 1988 a M41B was sent for tests in Denmark, and a partnership involving Bernardini and Krauss-Maffei through its subsidiary GLS for just the replacement of gasoline engine original by Scania diesel DS14. The vehicle performed a battery of tests in Alborg, demonstrating the feasibility of the project. The Danes went on to develop a project of their own modernization, wider, opting for Cummin engine s ATV-903TR of 465 hp, in addition include a war NBC system, thermal vision integrated into a system of night-vision Periscope, using German equipment. They also created a fire system and modified the 76 mm cannon, keeping it with ability to shoot AFPDS ammunition. Receiving the designation of M41 DK1, it was operational until 1999. Already in Uruguay, Bernardini had joined with the ITC-International Trade Consortium Ltd and in 1988 with the participation the of Servicio de Material y Armament, 2 Armored Caballeria and 4 mechanized regiments had the replaced all 22 engines M41 A1U, acquired from Belgium, 90 mm Cockerill Cannon mark IV in 1980, by the Scania DS14EX1 that was named M41 A1UR (Uruguay).